#1. This week's number one is an international power forward Mathias Calfani (204-92, agency: Pro Sports, currently plays in Liga Americas). 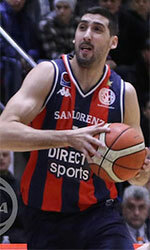 He contributed to a San Lorenzo's victory against the closely-ranked San Martin Corrientes (1-2) 71-59 in the Liga Americas in Saturday night's game. Calfani scored 9 points, grabbed 5 rebounds and made 4 blocks in 22 minutes on the court. It was the game of the round between two top 4 ranked teams. San Lorenzo de Almagra (3-0) is placed first in the Liga Americas. So far his team won all three games in the Regular Season. The Regular Season already ended in the Liga Americas. This year Calfani averages: 8.7ppg, 4.3rpg, 2.0apg, 1.7bpg, 2.0spg, 2FGP: 61.5%, 3FGP: 37.5% in three games he played so far. He is currently a member of the Uruguayan senior national team. #2. Second place goes to an international point guard Bruno Fitipaldo (183-91, also represented by Pro Sports, currently plays in Spain). Fitipaldo helped Burgos win their game against the league outsider Gipuzkoa (4-16) crushing them 96-73 in the Spanish Liga Endesa on Sunday night. He recorded 6 points, 12 assists and 4 steals in 28 minutes. San Pablo Inmobiliaria Miraflores Burgos (8-12) is placed 13th in the Liga Endesa. This year Fitipaldo's overall stats are: 8.4ppg, 1.9rpg, 4.9apg, 1.2spg, 2FGP: 55.1%(27-49), 3FGP: 35.7% and FT: 83.8% in 19 games. He is in the roster of the Uruguayan senior national team. #3. The Uruguayan player who performed third best last week abroad was an international guard Diego Garcia (183-92, currently plays in Argentina). Garcia helped Hispano Americano de Rio Gallegos win their game against the 18th-ranked Quilmes MP (3-10) 88-74 in the Argentinian La Liga in Tuesday night's game. He scored 10 points and added 3 passes. Hispano Americano de Rio Gallegos (7-6) is placed 11th in the La Liga. But this is still an early stage of the season and everything may happen. It's Garcia's first year with the team. Garcia's total stats this season are: 6.2ppg, 2.5rpg, 2.9apg, 2FGP: 55.3%(21-38), 3FGP: 40.9% and FT: 64.7%. He is also a member of the Uruguayan senior national team. #4. Point guard Santiago Vidal (180-89, another player represented by Pro Sports, currently plays in Spain) led Ourense to a 3-point victory against the closely-ranked Oviedo CB (13-8) 81-78 in the Spanish LEB Gold (second division) on Saturday night. He scored 13 points and added 3 assists. Rio Ourense Termal (13-8) is placed sixth in the LEB Gold. It was his team's third consecutive victory in a row. Vidal's total stats this season are: 7.4ppg, 3.9rpg, 5.4apg and 1.6spg. He is also Uruguayan national team player. #5. Former U18 international small forward Rodrigo Deus (196-97, currently plays in Spain). Deus could not help Cazorla (8-9) to beat Marbella (14-3). He scored 7 points. The fifth-placed Cazorla (8-9) was crushed 86-65 on the road by the leading Marbella in the Group D-A. Deus' team will play only one more game in the Regular Season. And that game will be critical. It's Deus' first season with the team. His total stats this year are: 4.1ppg and 3.1rpg. Deus has a dual citizenship: Uruguayan and Spanish. He used to play for the Uruguayan U18 national team five years ago. #1. Martin Perdomo (185-G-95, currently plays in Chile) could not help CD Castro (1-1) in their last game on Tuesday. Despite Perdomo's very good performance the third-placed CD Castro (1-1) was defeated 90-84 on the road by the leading Las Animas in the Conferencia Sur. He was the top scorer with 33 points. Perdomo also added 6 rebounds, 4 assists and 4 steals. His team will play only one more game in the Regular Season. And that game will be critical. Perdomo has individually a very good season with high stats. He averages: 15.4ppg, 4.0rpg, 5.3apg and 2.0spg. #2. Agustin Zuvich (201-F/C-95, currently plays in Argentina) was the major contributor in a Gimnasia LP's victory against the fifth-ranked Parque Sur (10-14) 97-89 in the Argentinian La Liga Argentina (second division) last Monday. Zuvich scored 23 points, had 9 rebounds and made 3 blocks (went 8 for 8 at the free throw line) in 32 minutes. Gimnasia y Esgrima La Plata (8-17) is placed eighth in South - C.South group. It's Zuvich's first season with the team. He has relatively good stats this year: 11.5ppg, 9.1rpg, 1.4apg and 1.3spg in 25 games he played so far. Zuvich has a dual citizenship: Argentinian and Uruguayan. #3. Emiliano Giano (180-PG-89, currently plays in Spain) was not able to help Navarra in their game against Zamorano (13-8) in the Spanish LEB Silver (third division). Giano cannot count it as his best performance. He scored only 2 points in 10 minutes. The first-placed Navarra (14-7) lost 73-80 at home to the second-ranked Zamorano in the West group. It was Navarra's first loss after six consecutive victories. Giano's team will play only one more game in the Regular Season. And now that game is very crucial. This year Giano's total stats are: 0.7ppg and 1.3rpg in three games. He is another player who holds two passports: Italian and Uruguayan. Notice: The list above includes only some of the Uruguayan playing currently abroad. Go to Uruguayan Abroad Page to see completed list.